The site of Sandys Row Synagogue was once open-land called Old Artillery Gardens next to the pasture-land of Spital Fyeld’s, which was named after Henry VIII’s royal artillery, the ’Gunners of the Tower’ who used this place for experimenting with ‘great and small artillery’ in the sixteenth century. In 1681 the Old Artillery Ground was granted to George Bradbury and Edward Noell for £5,700, with a licence to build new houses on the Old Artillery Garden in the parish of St. Botolph’s, Bishopsgate. It is believed a wooden chapel was erected on this site and used by French Huguenot Protestants. In the 1840s Dutch Ashkenazi Jewish migrants mainly from Amsterdam began arriving in Sptialfields. They were economic migrants seeking a better life, rather than refugees fleeing persecution like the thousands of Ashkenazi Jews who came after them in the 1880s from the Pale of Settlements. The Dutch Jews settled in a small quarter of narrow streets in West Spitalfields known as the Tenterground, which was originally open land named after the tenters; wooden frames used for drying and stretching cloth. The ‘Tenter’ area included the streets of Whites Row, Tenter Street, Artillery Passage and Sandy’s Row. The Dutch Jews occupied this narrow maze of streets and continued to practise the trades they had bought with them from Holland, which were predominately cigar making, diamond cutting and slipper and cap making. Many small workshops were established in the Tenterground area and businesses were passed on within generations of families. Within this area a small, distinctive, tight knit and self-sufficient Dutch Jewish community was formed of about a thousand people. They had their own practises and customs, which were different from other Ashkenazi Jewish groups. To the frustration of the more established Anglo-Jewish population living in the area at the time, ‘the Chuts’ (as they were known locally) refused to join any of the existing synagogues. Instead they rented a small room in a building on Whites Row Spitalfields, (close to Sandys Row) where they held daily prayer meetings and Shabbat services. Festival services took place in a larger Zetland Hall in Mansell Street. In 1854 fifty Dutch Jewish families from this community formed a Hebra (a friendly society) called the Hevrat Menahem Avalim Hesed v’Emeth, which translates from the Hebrew as the Society for Comfort of the Mourners, Kindness, and Truth. This friendly society originally functioned as a mutual aid and burial insurance society but as the community expanded the society began fundraising. In 1867 enough funds had been amassed enough to purchase the lease on the chapel in Sandys Row, which the society had been renting for sometime, the building was known as The Parliament Court Synagogue. The society secured a mortgage of £700 on the building, which was paid off in 1929. One of the most famous synagogue architects of the time, Nathan Solomon Joseph, was employed by the society to remodel the former chapel. Solomon kept many of the original features of the Georgian interior, including the roof and the balcony, which was perfect for the women’s section of the synagogue. The original entrance to the chapel had been in a tiny alley called Parliament Court which now runs along the back of the synagogue building. Because Jews pray in the direction of Jerusalem, which, in London, is towards the southeast, the original entrance to the building was bricked up and the Torah Ark was placed on the southeast wall, and a new front door was created on the northwest of the building, opening onto Sandys Row. The design of the interior of Sandys Row was based on The Great Synagogue in Dukes Place (since demolished) with a coved ceiling, cornice, clerestory windows and a Neo-classical mahogany Torah Ark set into an apse. Much of the interior is unaltered since its construction in the nineteenth century apart from the pine pews and the wood pine panelling, which covers much of the interior walls. These features were added in the 1950s. The consecration ceremony for Sandys Row Synagogue was performed in 1870 by the Haham (the head rabbi of the London’s Spanish & Portuguese Jews Congregation), as the Chief Rabbi of London, Nathan Marcus Adler, refused to conduct the service as he was opposed to the establishment of a small independent congregation so close to the large established City synagogues. 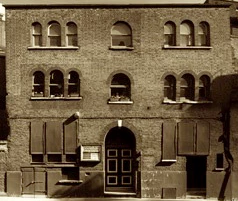 In November 1887, Sandys Row Synagogue was the largest of the East End congregations that founded the Federation of Synagogues. It left the Federation in 1899, and was refurbished for the 50th anniversary of the community after acquiring its freehold becoming an Associate of the United Synagogue in 1922. In 1949 it returned to independent status. 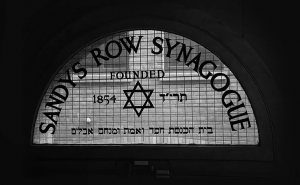 Throughout the history of the synagogue Sandys Row has remained independent apart from a short period during the Second World War when they belonged to the United Synagogues to facilitate the amount of burials in the area due to the bombing raids. For many years the Synagogue acted as the secretariat of the Stepney and Whitechapel Street Traders’ Association, bringing together all the market traders from both Petticoat Lane and Whitechapel Markets. During the Second World the synagogue was not directly hit but shock waves from bombing nearby damaged the structure of the building. In the 1950s the synagogue flourished. On Shabbat there was always 100 to 200 people there, and on the high Holy days, Rosh Hashanah, Yom Kippur, you could not get a seat, people sat on the floor in the aisles. By the 1970s the synagogue was in decline. Most of the Jewish population had moved out of the East End and membership dwindled. By the 1990s the synagogue nearly closed down, it struggled to achieve a minyan, so the remaining members, many of whom have parents, grandparents and even great grandparents affiliated to the shul, formed a board of management and now again membership is slowly increasing with a new Jewish generation moving back into the East End. 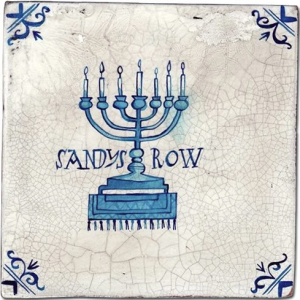 In the past two years Sandys Row had five weddings and two bar mitzvahs at the synagogue. 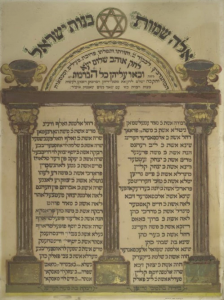 This article was written by author Rachel Lichtenstein who has been working part-time at Sandys Row Synagogue since 2013, Rachel is currently working on a new book about the history of the synagogue alongside various other archive and digital projects. For further information please visit ourhiddenhistories.com. The Sandys Row archive is held at The Bishopsgate Institute Archives, public access to this material is available in the Reading Room.